Of course, there's always a lot of crappy music in whatever time period - it's just that there was so little good following rock's "Golden Age" and there was so much bad. The biggest hit of 1963 - Sugar Shack by Jimmy Gilmer and the Fireballs – epitomizes the problems of those lean years. Is this the worst song of all time? I won't make that claim, but it must be close! (Don't believe me? Find our for yourself: http://www.fireballs-original.com/wavs/sugshack.wav.) No wonder the Beatles did so well the following year. 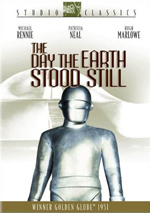 What was that science fiction hit from 1976? Logan's Run. That clunker apparently was the best the genre had to offer before George Lucas came along to liven things up - now that's a scary thought. 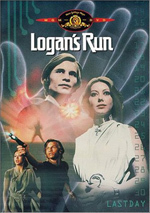 I never saw Logan's Run during its theatrical release, although you'd think I would have been in the target audience. After all, I was nine in 1976, and it seems like the kind of film I would have seen, but for whatever reason, I didn't. In fact, I'm not sure I ever saw it prior to watching the DVD. I recall seeing the TV show spinoff in the late 1970s, but I can't attest with any certainty that I ever viewed the film itself. 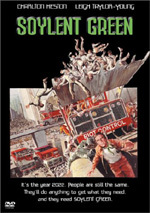 Logan’s Run appears in both an aspect ratio of approximately 2.35:1 and in a fullscreen version on this double-sided, single-layered DVD; the widescreen image has been enhanced for 16X9 televisions. Only the letterboxed picture was reviewed for this article. Many problems arose in this weak transfer. Source flaws generated a lot of the concerns. Throughout the film, I constantly witnessed specks, spots, grit, marks, blotches and nicks. These were there much of the time and created many distractions. Colors looked erratic. While a few shots presented reasonably vivid hues, most of the tones came across as blotchy and messy. Blacks were excessively dense, and shadows appeared somewhat thick and flat. Sharpness continued the run of troubles. Prominent edge enhancement showed up through the movie, and this left wide shots as messy and undefined. Close-ups usually looked fine, but other bits tended to be soft and fuzzy. I noticed sporadic examples of jags and shimmering as well . The movie suffered from a consistently problematic transfer. On the other hand, the Dolby Digital 5.1 soundtrack of Logan’s Run worked very well for a movie from 1976. The soundfield proved to be quite impressive. It used all the various channels to good effect. Music showed nice stereo presence and also popped up from the rears with frequency. We got a lot of directional speech, and effects appeared in their accurate locations. These fixed us with a good sense of place, especially during the action sequences. Although the elements occasionally seemed a bit “speaker-specific”, given the flick’s age – and the fact it came from an era in which mono was the rule – I could easily forgive this minor distractions. Audio quality was a little weaker but fine overall. Though speech seemed a little reedy at times, the lines remained intelligible and reasonably natural. Edginess was a minor concern. Music sounded quite good, as the electronic score demonstrated very positive life and vivacity. Effects occasionally packed a punch and were pretty decent, though some louder bits – such as the crowds at Carrousel – were somewhat distorted. The rougher edges kept the track from “A”-level consideration, but I thought it was a fine mix nonetheless. The disc’s extras open with an audio commentary from director Michael Anderson, actor Michael York and costume designer Bill Thomas. Each man sits separately for this edited track. We learn about how both Anderson and York came onto the project, cast, characters and performances, story issues and deleted scenes, costumes and sets, locations and visual design, various effects, and a mix of other production subjects. 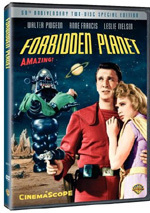 In addition to the movie’s trailer, the DVD includes a vintage featurette. Called Logan’s Run: A Look Into the 23rd Century, this nine-minute and 20-second piece mixes movie clips, behind the scenes materials, and interviews. We hear from Anderson, York, producer Saul David and actor Jenny Agutter. “Look” discusses the movie’s story and characters as well as it sets, visuals and effects. We get a glimpse at how the production used all of these elements. Don’t expect a lot of detail here, but we find many good shots from the set and learn more than we usually find in this sort of promotional featurette. It probably doesn't take a fortune teller to see where the conclusion to this review will go. Logan’s Run offers a goofy, extremely dated piece of sci-fi cheese. It borders on unwatchable. The DVD presents very good audio but suffers from weak picture quality. Extras seem light, but at least we get a terrific audio commentary. With a list price of less than $10, it’s hard to steer fans away from this DVD, but the dreadful picture quality will disappoint them. Others not as entranced by this atrocious flick should avoid it like the plague.